Clunes Villa was originally built in 1920 for the exclusive use of the British Planter Mr.John Dunlop. The bungalow maintains its past glory to fit with modern times although extensive repairs were carried out by Clunes Villa Real. 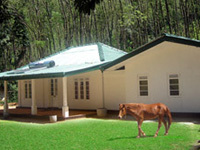 The bungalow, which is situated on Errachi Division Talduwa Estate Dehiowita in the Kegalle district, is surrounded by mountains and forests. Clunes Villa is situated in Dehiowita, which is 6 km from Avissawela town on the main highway to Hatton. The drive takes you about 1.15 hour from any part of Colombo and you can arrive at the Villa within two hours from the Bandaranayake International Air Port. The Villa is centrally located in close proximity to most of Sri Lanka�s Natural beauty and its world-renowned heritage. The Villa is an ideal base for excursions to Sinharaja Virgin Forest, Udawalawe Wildlife Sanctuary, Botanical Gardens, Pinnawela Elephant Orphanage, Horton Plains, Little England in the mountains, Adam�s Peak, Saman Devalaya, Temple of the Tooth Relic, Dutch Fort, Beli Lena and many more places of interest. The Villa is surrounded by rubber estates, tea estates and is in close proximity to Sri Lanka�s heavenly waterfalls. If you are an adventure lover you can experience white water rafting at Kithulgala just 30 minutes away from Clunes Villa. Experience a day out with your family at Water World a child�s paradise just 20km from the Villa. 48Km from Colombo to Avisswella, from Avissawella just 5 1/2 Km on the Hatton colombo main road. The Road to Clunes is situated inbetween Talduwa and Dehiovita. If you are travelling from Colombo to Hatton the Road to Talduwa Estate is placed on the Left Hand side, and from there you have to come 1 1/2 Km. All the roads are properly developed and laid tar. You can use Cars, Jeeps, Vans in to the Villa without an issue. The drivers special cabins are avialable too. Set Menu Options are avialable. Local and Foreing Dishes are served.